Welcome to All Nations Food Forest – Melbourne’s First Council Built Food Forest Project, and possibly the first in Australia! Food forests are Nature’s way of growing food, the most sustainable and productive system known, that require minimal effort to maintain by taking advantage of ecological processes that have evolved and been perfected over hundreds of millions of years. In the simplest terms, food forests are constructed to resemble natural temperate forests, but are filled with the useful and edible trees and plants that we have chosen. They are an ecological garden design and differ from any other food production system because they are true living ecosystems! Real forests don’t need any work, they self-maintain — no pesticides, herbicides, weeding, crop rotation, mowing or digging. Food forests don’t need any of this either! If we look beyond our modernised culture to Nature’s most advanced and life-abundant plant growing systems, it is clearly evident that working with Nature is the wisest and most productive path to sustainable food production.Less work, more food, all natural! Why would you do anything else? So we decided to build one in public space! This is the first in a series of ongoing articles which will document the progress of this project as a case study in urban agriculture, which can hopefully serve as a template for other community groups or local government bodies who are looking to initiate similar projects which aim to put food production in public space . First we we look briefly at the projects that served as forerunners to this one, and then we will delve into how this project was initiated. 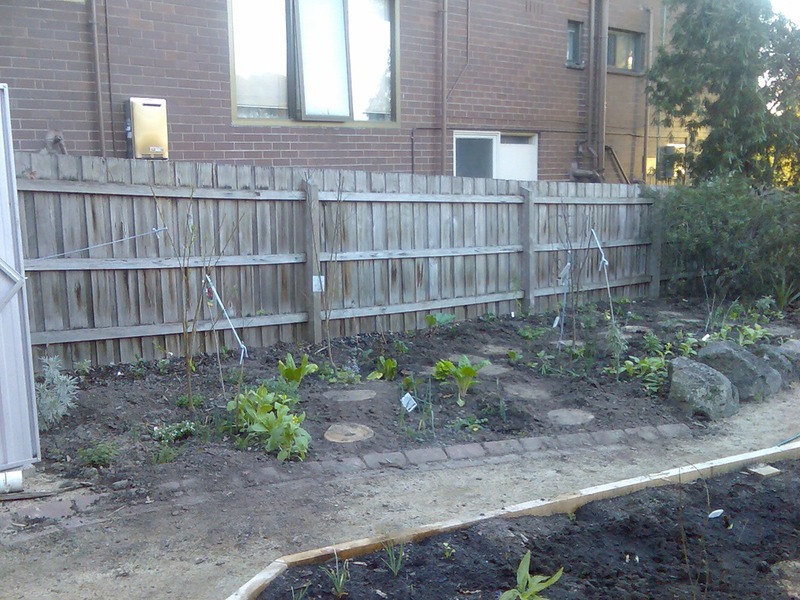 The All Nations Food Forest grew out of the success of the Northcote Library Food Garden (NLFG), a communal garden where all gardeners share the whole site all the produce. NLFG incorporates some elements of food forest gardening, and the small scale food forest garden that I designed there was inspired by the success of my own demonstration backyard food forest, so there’s a bit of history to explain! I’ve been a public advocate of food forest gardening for a long time, and built Melbourne’s first demonstration backyard food forest in 2008, which was made possible when I pioneered a way of scaling food forests down to urban environments using the system of backyard orchard culture. I designed and built a proof-of-concept demonstration garden, which produced the equivalent of over 14 tonnes per acre in its fourth year, all this from a sustainable, organic, water-efficient garden that utilises natural pest controls, all of which is documented in my website Deep Green Permaculture. This demonstration backyard food forest garden won the Darebin Sustainability award for the house and garden category in 2013, and featured prominently in the Australian Open Garden Scheme in early 2014, where we had the most visitors of all the produce gardens in Victoria, with 480 people visiting in a single weekend. Technically, I had succeeded in pioneering a small-scale intensive food production technology, proven how much food it was technically possible to produce with limited space, demonstrated to the world what one person can achieve on their own, and received official recognition. Having achieved what I initially set out to do, inevitably, the question arose – what next? There are lots of issues needing attention in the world, important things that make a difference. With the issues of climate change, peak oil and food security looming on the horizon, the call to action couldn’t be clearer. The majority of people live in cities, where the least food is grown, and that’s a problem in the making if there ever was. Through my work it became clear that any efforts in sustainable food production needed to include a critical element – community. The most resilient model of food production is one that doesn’t just rely on rural agriculture to feed the people in the cities, as every little patch of soil growing food adds up, no matter where it is. With peri-urban agriculture growing food in market gardens at the fringes of the cities and urban agriculture producing food within cities supplementing what we grow in rural areas, we eliminate any weak links or single points of failure in our food production systems. 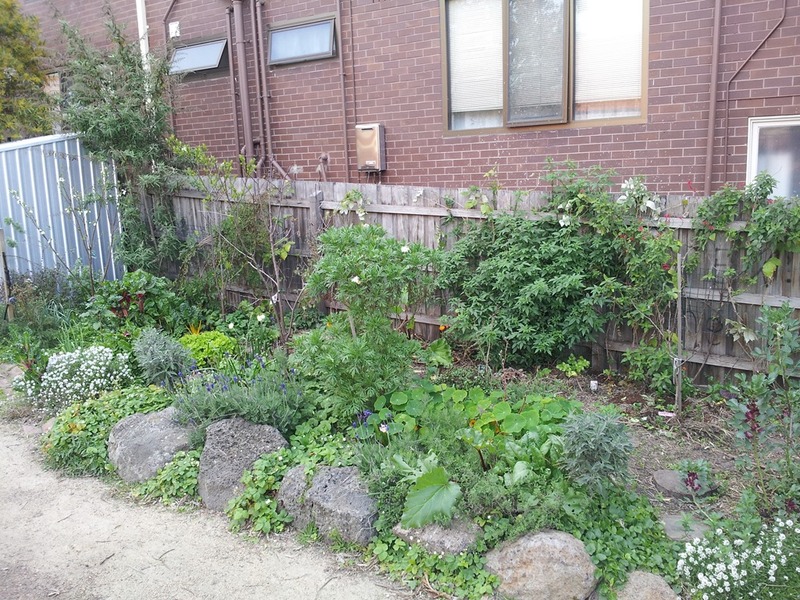 To get food forests into public space, building one in a community garden was a good place to start, and that’s where Northcote Library Food Garden provided the ideal opportunity. 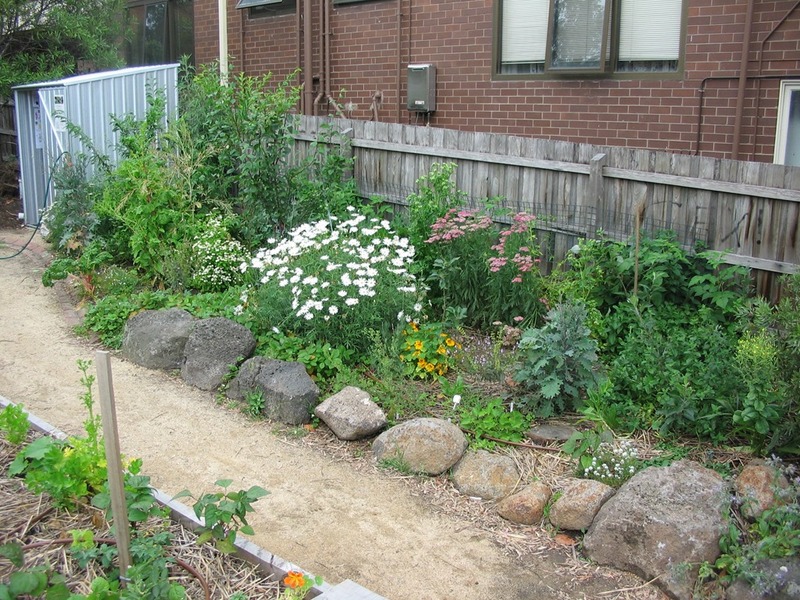 The Northcote Library Food Garden was developed by the City of Darebin as part of its sustainable food program. A community consultation process began in late April 2011 and the first community planting day was held three months later in July. The garden is managed by a committed group of residents for the benefit of the community. It is a productive growing space, as well as a place for gathering, for education and for demonstrating sustainable gardening practices. The Northcote Library Food Garden joins an exciting array of sustainability and gardening projects and networks operating in the inner-Northern suburbs of Melbourne. The garden features three large communal growing beds, which have been planted out with annual and perennial edible plants, as well as a variety of companion and beneficial plants. In addition, a Food Forest is taking great shape in an additional bed. The Food Forest follows the principles of other forests, with a canopy, mid-layer and ground covers, however, the Food Forest’s layers are made up of fruit trees, and edible shrubs, berries and herbs. Children love stepping along the forest pathway through the fruit trees, searching for berries to munch on! The garden has been established as a communal plot in order to maximize growing space. It functions using a communal planting and harvest model. A monthly planting, harvest and working bee day takes place on the second Sunday of each month, with gardeners committing a further 1-2 hours a week of their available time. On the community days, the available harvest is shared with those present, and gardeners are welcome to harvest a reasonable share of anything that is ready to pick at any other time. The garden is chemical-free and operates using broad permaculture and organic principles. A native plants and bush food area was begun at the Southern end of the garden in Winter 2012, and this will be expanded in time to come. Gardening workshops are held from time to time as part of broad educational aims for the garden.The Northcote Library Food Garden is open for members of the public to enjoy and it is hoped that it will become a place where the community can meet, children can explore and people can learn about growing their own food. The site started off as a vacant block of land with grass and native beds lining the fences. The lawn area was dug out and two large raised beds were constructed, which were filled with a fine grey dusty sand that was meant to be ‘soil’. The surrounding areas were covered with landscaping toppings which made the garden more manageable, and a water tank with pump was installed. Parts of the native beds were cleared to create more garden space. The council consulted with the public and oversaw the formation of an interim management committee of community members who took ownership of the garden. Seila Hierk, of Child’s Play Permaculture, agriculturalist, teacher and permaculture designer, who specialises in intensive annual food production systems, school gardens and Asian vegetable gardening. 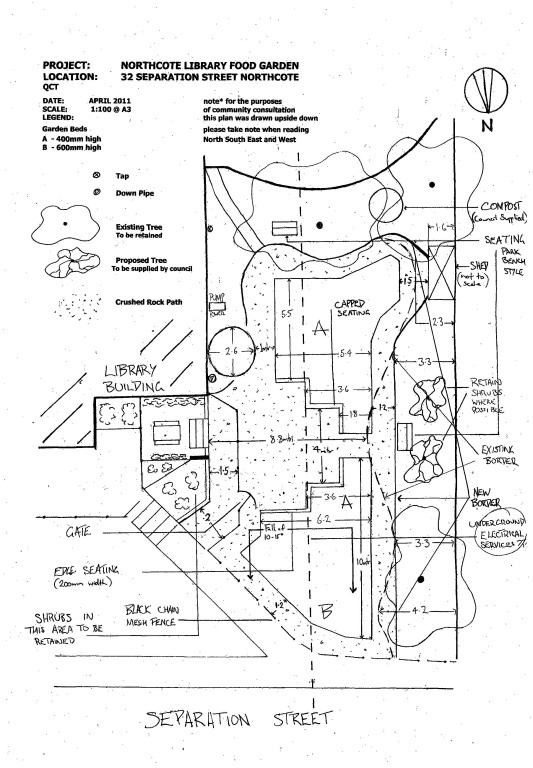 On handover, there was no budget, therefore no plants, we were given a site plan (see below) and we took it from there. Charlie contacted many other community groups and gardens, who kindly donated enough plants and fruit trees to nearly fill the whole community garden on the first community planting day. I designed a mini food forest, a multisensory children’s food forest, which was to become the bridging project to All Nations Food Forest a year later. 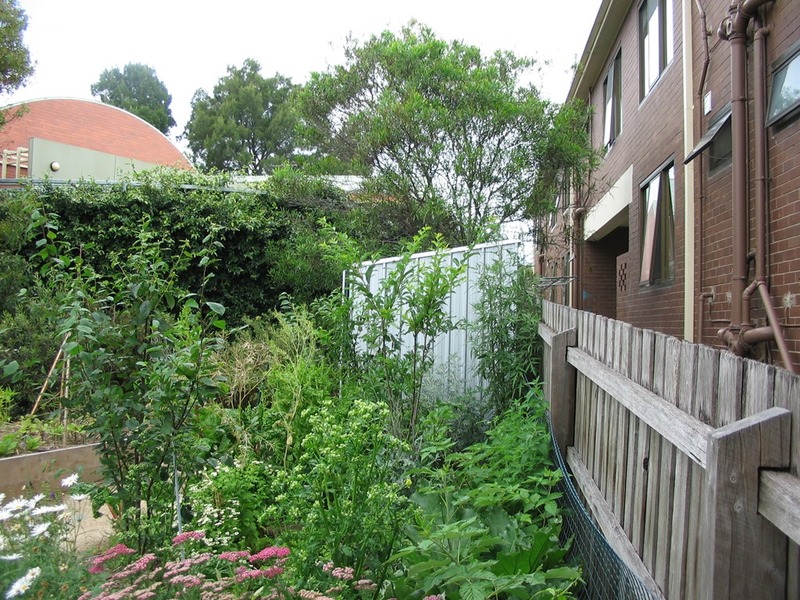 The space allocated for a small food forest was very small, situated in an existing native plant garden bed between a shed and a giant eucalyptus tree, backed by a shady fence. Luckily the soil was decent, far netter then the imported soil in the garden beds.The idea was to create a garden area that was accessible to children where they could browse and forage for fruit and berries. I created the design and produced the design rationale, as detailed below. 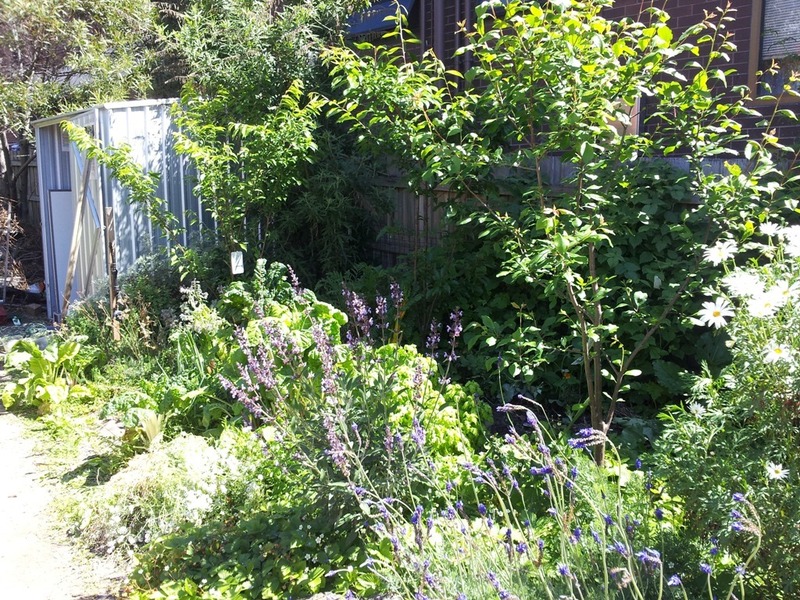 The Northcote Library Food Garden (NLFG) showcases various styles of gardens and gardening techniques – traditional style organic vegetable gardens, an indigenous/native Australian bush food area, an ornamental flower garden and a food forest garden. The food forest was designed with children in mind. The aim was to design a natural garden space which children could explore and interact with, engaging all their senses. In such a space, they could experience the sights, smells and textures of a ‘sensory garden’, and also harvest tasty fruits and berries. The children’s food forest is also an educational space for adults, as it is also a proper working demonstration food forest gardening system. As such, it is a sustainable, small scale, intensive food production system which emulates a natural woodland forest. Like all food forest gardens, It is comprised mainly of perennial plants, displays multiple ‘layers’ of plants from ground covers and small herbs through to shrubs, fruit trees and climbers. It is a productive, biodiverse living ecosystem that utilises natural pest and weed controls, such as companion plants to repel pests and attract beneficial insects. It is one of the most sustainable gardening models because it works with nature, and lets nature do all the hard work – no digging, spraying or weeding! Designing a food garden for children requires more planning than a regular garden used by adults as there are more considerations to take into account. 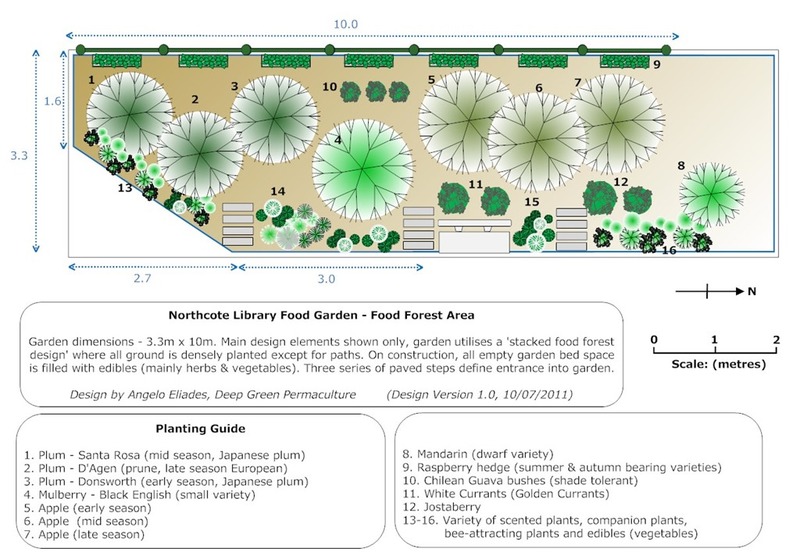 The Children’s Food Forest garden design accommodates the needs and requirements of children, as detailed below. Natural Spaces – children have a preference for a less formal, more natural harmonious spaces. The forest garden design creates an environment that children can immerse themselves in, and it does not reveal everything at once, so that children can explore it, satisfying their natural curiosity. Multiple functions – all plants are chosen for multiple functions, scented plants are also companion plants, pretty flowers are attractants to pollinators such as bees. 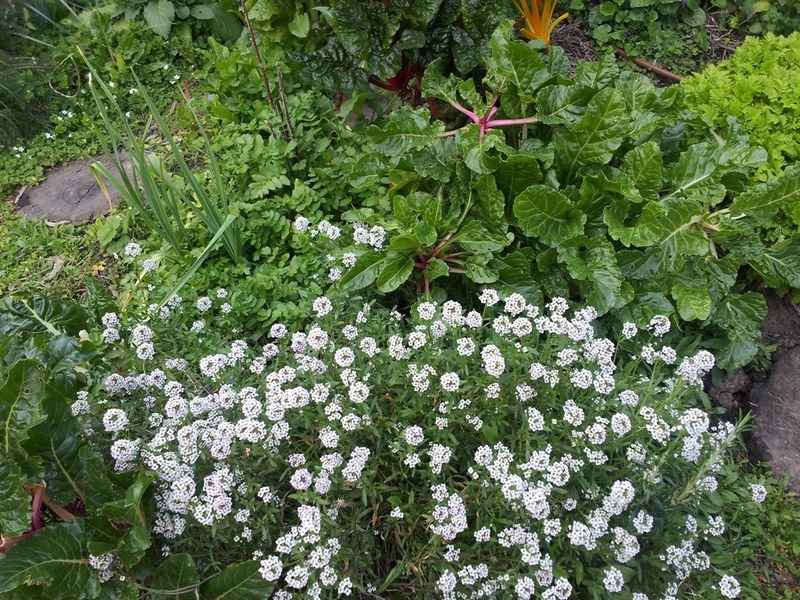 Ground cover plants, which create a living mulch, protecting the soil and preserving water are also culinary herbs such as thyme, oregano, and mint which have fragrant leaves. Another groundcover used around borders is the alpine red strawberry, flavoursome miniature strawberries which is held up off the ground naturally be the plant, so they are not eaten by pests. 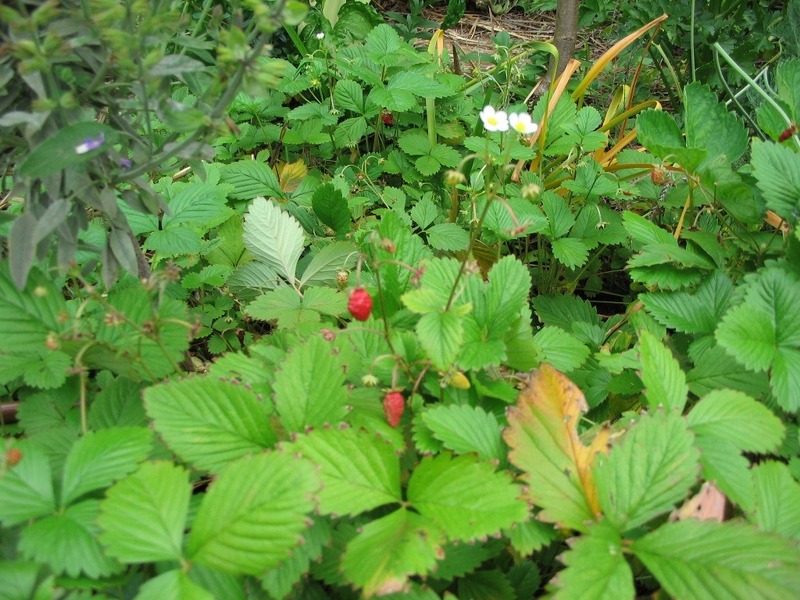 Children enjoy foraging for these prolific little strawberries. Scale –the garden design is scaled down to the height of a child, shrubs that create some cover for children to make it ‘explorable’ are no higher than a child’s shoulder height so adults can easily see over such a low screen and keep an eye on them. Garden plantings are narrower so that children can reach into the garden to pick a flower or berry, or touch an interestingly textured, shaped or scented leaf. Similarly, fruit trees are pruned to maintain a lower height so that the fruit within easy reach. Seasonal Interest – the garden is always green and looks interesting because the plants are mainly perennial and there is a good mixture of evergreen and deciduous plats. Fruit is specifically chosen to appeal to children, lots of sweet, colourful fruit – plums, apples, strawberries, raspberries, mulberries and currants to name a few. 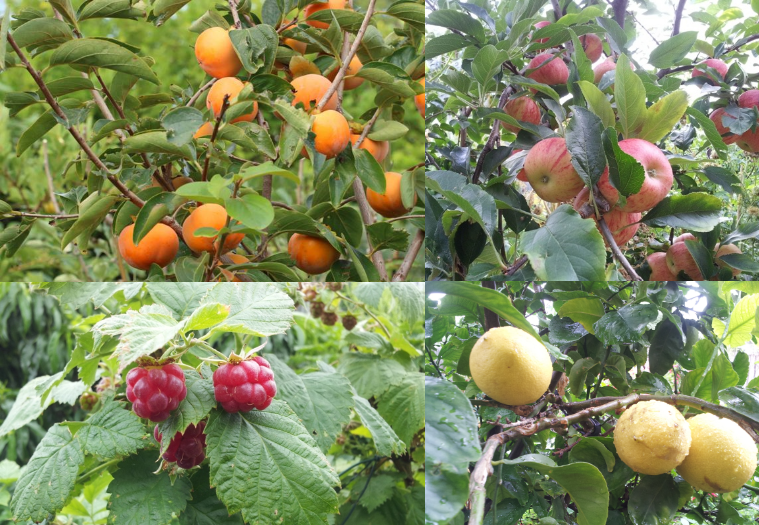 To ensure as long a fruiting season as possible, early, mid and late season varieties of fruit trees have been chosen to provide fruit across a few months. Different types of fruit have been chosen to provide fruit throughout the year, hence the addition of citrus for fruit in the cooler months. Natural Boundaries – to direct children’s exploration through the garden, paths are clearly laid out using steps or pavers made of sliced logs. The entrances/exits are clearly defined using steps, and shrubs are grown on either side create a natural path/barrier. Plants are used to direct human foot traffic, openings and clearings naturally show walkways, shortcuts through the garden are not possible because shrubby plants create natural obstacles that are too hard to cross. Safety, Health & Education – plants are chosen that are safe, all fruit can be picked and eaten without concerns, raspberries have no real thorns and are safe for young hands, in other areas of the garden, thornless berry varieties are chosen. A range of fruit and berries are chosen to introduce children to healthy, fresh food. The opportunity to see food growing, harvest it, and eat it will hopefully encourage healthy eating habits in children as they grow older. By being able to experience nature in a positive way, by being able to observing the seasonal nature of the harvest, children will hopefully better understand nature through a direct experience of first-hand interaction. Maintenance – the forest garden is mainly comprised of perennials, which grow year after year, and don’t need to be replanted each season like annual vegetables. Since perennials are slow growing, they need less fertiliser, and because they are deeper rooted than annuals, they require far less water. Regular pruning of fruit trees is carried out as per backyard orchard culture practices to keep trees small, they are pruned three times a year – winter, spring and summer. Other plants are pruned back during autumn winter to keep them tidy. All clippings and prunings are chopped up and put back into the garden as mulch. Annual vegetables are interplanted throughout the food forest in any empty spaces to add interest and provide a few more edible varieties. Since the design is a food forest garden design, which is centred around the trees, it typically tales approximately 4-5 years for the fruit trees to become fully established and produce heavily. With only donated plants, we began construction of the garden. This is what the children’s food forest looked like on the planting day in June 2011. It’s hard to see what the design is supposed to look like, as only the major foundation plants are shown in the design schematic, all the companion plants are not marked in the design simply because in the garden they occupy all available space in great numbers in the garden to leave no bare soil, if they were included in the diagram it would render it unreadable.Proper measurements are denoted in metres to give a sense of human proportion, as opposed to ratios such as 1:1000 which are meaningless and relative to the size of the paper they are printed on. The size of the fruit tree canopies are clearer in this photograph, also dated December 2011. Around 18 months later, in December 2012, tree canopy level is evident, it’s looking like a proper food forest that children can run through. The photo clearly shows the amount of shade cast by west side fence and tall building behind it. Food forest ground covers established to protect the soil and act as a living mulch. 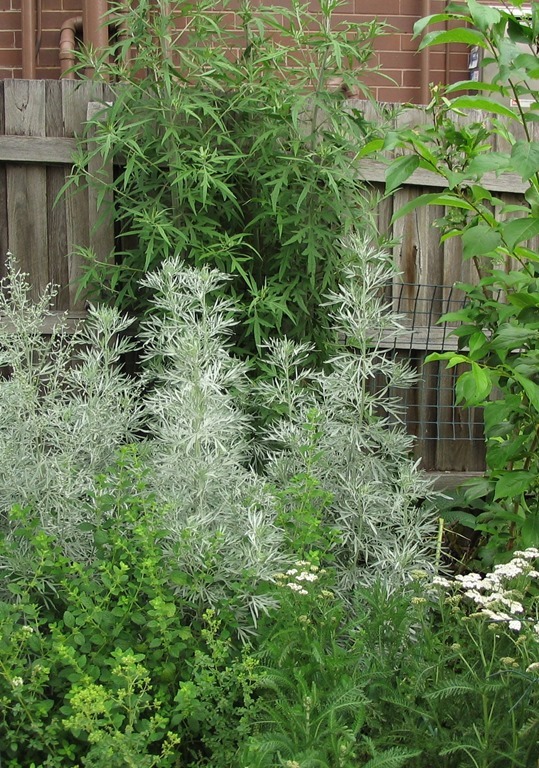 A sea of beneficial plants, pest repellent wormwood, tree mugwort and lemon balm, with yarrow flowering in the foreground as a source of nectar to feed beneficial insects – all part of the design’s natural pest control scheme. Alpine strawberries make a great edible border of super-tasty small strawberries which kids love! These photos were all taken two to three years ago, and the garden has grown considerably since then and has gone through further changes as decided upon by the gardeners who work on the communal plot. The success of NLFG inspired the advisory group to attempt something bigger and more significant in terms of community benefit. All Nations Park was an obvious site choice as it is close nearby and only a short walk away. This park has a colourful past, It started off as a clay hole for the Northcote Brickworks, then became a council tip, which was then capped and converted into parklands. Being on top of a landfill site would make it the technically most complicated choice, with the most stringent and restrictive conditions in terms of what we can and cant do there, but as a template for other public space gardens, if it can be done here, then it can be done anywhere else with much less trouble. When we researched the council history and spoke to people who were formerly in government, we discovered that our chosen site had an even more colourful past than we first imagined. All Nations Park was meant to be designed with a theme in mind, representing the various ethnicities in Darebin hence ‘all nations’, which it more or less failed to live up to its name because of the major political drama that transpired before the project was completed. in 1997, the Kennett State Government ran an inquiry into dissatisfaction with the performance of the first Darebin Council, and the Elsum Report they commissioned found that factional differences led to poor governance on the Council. The result was that the whole Council was sacked and the State government appointed a commissioner, until an elected council was reinstated about eighteen months later in 1998. It appears that during the caretaker period orders were given to finish the project as soon as possible. This explained why the design feature that is supposed to represent all the nations is a tokenistic partially-failing olive grove planted uncreatively in a grid in poor soil that barely holds the roots of many of the trees. There’s also a slowly failing circular planting of ornamental Nashi pears which even the possums won’t eat, which fall to the ground. It was left at that, the rest is predominately eucalypts and some unspectacular shrubbery. We as a group looked at the site and figured it could be enhanced significantly to better represent “All Nations”, and to draw more people to to the park, to build community, and to provide food. So Charlie, John and I thought up of an event that we could run under the Sustainable Living Festival, where we could bring together representatives form the council’s Sustainability department and members of the general public, and walk through the park, and share ideas of how we could improve it with a food forest. In coming up with the theme of the event, we looked at what we were proposing, a community food forest, and Charlie had the realisation that it was also about creating community, bringing people together, growing food for food security, and looking to forests as a strategy of increasing tree canopy coverage as part of the City of Darebin Urban Forest Strategy where the council in 2013 promised to double tree canopy area in 15 years. So the theme became Community + Food + Forest. This is what we advertised and we got a huge crowd, the response was great from both the council and the public, we had sown the seeds of an exciting new project! After a successful event, we advertised to invite members of the general public to join the upcoming project. Valuing community ourselves, we were in contact with the Dunstan Food Forest group in Moreland and the Ashburton Food Forest group who were both already well ahead of us. They were working on slightly different projects, theirs weren’t built by council, the former group was proposing to resurrect an abandoned food forest from way back which had simply become an orchard, and the latter group was in the process of acquiring an new site in public space which they would construct themselves. As a community we were able to visit each others sites and share ideas, which was tremendous. As a historical note, both these groups have completed their projects successfully as ours is still in progress as I write this piece. Please feel free to comment or ask questions on any aspect of this project, thanks. This entry was posted in What's New! and tagged All Nations Food Forest, case study, comminty food forest, community garden, Darebin, food in public space, food security, Northcote Library Food Garden, Permaculture, sustainable gardening, urban agriculture. Bookmark the permalink. This is fabulous, I have started volunteering in a local children’s centre and it has clarified some things that need to be taken into account. I would love to come and have a look one day. Love it…something we aspire to create…..we are situated in central NSW. Are about to embark on renovating a playground at our local school……have received a couple of grants to kick us off. Would love to create something similar…would love any additional info you could share with us, Is Seila available for assistance? Very interested to have been given this link by another local friend of mine. 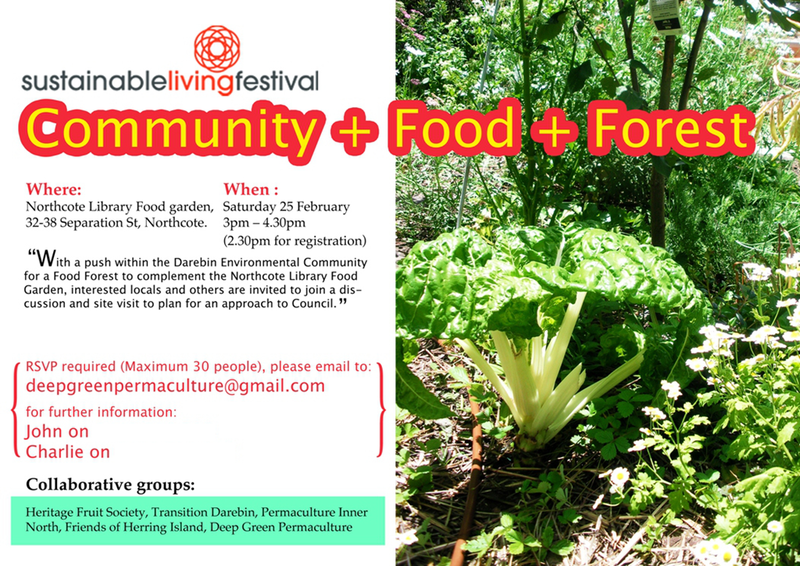 Great to hear that the Dunstan Food Forest has a new group to re-establish the early principles of this project. Myself and a group of others designed and implemented this project many years ago, with the assistance of funding by the Moreland City Council. Would be great to hear of the new work being done to re-establish this site as an intended food forest. It’s great to see more public food forest type projects being implemented for people to enjoy. keep up the great work.